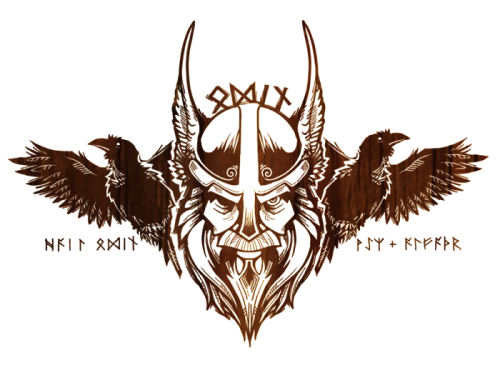 The idea that the Odinist must strive not just to become Odin but to surpass him – to seek to realize an ideal of perfect knowledge and supremacy – is obviously a very provocative one. And my readers will want to know exactly how this path is followed. But first, I want to further explore the curious fact named above: that the Allfather, the chief god of the Germanic peoples, is a seeker of wisdom. What we will find is that this gives us a key that can unlock three things: the nature and purpose of the cosmos itself, the nature of the Germanic peoples, and the cosmic role or mission of the Odinist. The first and third of these issues will be explored in this section. The second will be discussed in the section that follows. Let us briefly review the Germanic creation story, as it has come down to us in Snorri’s Prose Edda. It can be divided into three ages or stages: the elemental age, the age of the Titans (drawing this term, of course, from a parallel stage in the Greek creation myth), and the age of the gods. In the beginning, all that existed were two elemental realms: Muspelheim in the south, filled with fire, and Niflheim in the north, an ice realm. These two elements, fire and ice, are impersonal and unconscious. Snorri tells us that there are inhabitants of these realms, but apparently they are not conscious beings. The fire giant Surtr lives in Muspelheim, but arguably the chief characteristic of the giants is their lack of consciousness. In Niflheim, all that is to be found are countless venomous serpents. Between these two realms is Ginnungagap, a void whose name has been interpreted as “yawning gap,” but – more interestingly – as a “space filled with magical powers.” The icy rivers of Niflheim (filled with the “yeasty venom” of the serpents) flow into Ginnungagap, where the ice is struck by fiery sparks from Muspelheim. The result of this interaction between opposites is the coming into being of the Titans of Germanic mythology: the monstrous, unconscious, haphazardly-produced beings that precede the gods. The frost giant Ymir – father of the other frost giants – is first to be created. He survives by drinking the milk of Audumla the cow (who also somehow or other appears on the scene). From under Ymir’s left arm grow a “man and a woman,” and one of his feet begets a son with the other. Audumla draws sustenance from licking a salty ice block. But as she licks away the ice, the block forms into “a man” called Búri, “handsome and tall and strong.” As I note in my essay “The Ninefold,” it is extremely important that humanoid forms – so far, Ymir, the Frost Giants, and Búri – keep appearing haphazardly, without any intelligence seeming to guide the process. It is very much as if the human is the inexorable telos (the end or goal) of creation. Búri gives rise to a son, Borr, who weds Bestla, daughter of a giant. They are the parents of the brothers Odin, Vili, and Vé. And it is with them that humanoid consciousness first appears, along with humanoid form. Now the stage is set for the end of the age of the Titans, and its disordered production of monstrosities and abortive humanoids. Odin, Vili, and Vé slay Ymir, drag his body into the center of Ginnungagap, and from his dismembered remains they construct a cosmos, where before there had been little more than chaos. (Greek kosmos means “orderly arrangement,” related to the verb kosmein, “to arrange or put in order”; also “to establish a regime.”) In the center of everything the gods build Midgard, a realm for the human beings who they create out of two trees, Ask and Embla. And the gods also build a world for themselves in the heavens: Asgard. Bifröst, the rainbow bridge, links the realm of the gods to the earth. There is more to the account, of course, but the foregoing is all that need be told for the purposes of the present essay. It is important to note that Odin and his brothers (who Thorsson argues may actually be aspects of Odin) do not create everything; this is no creation ex nihilo. Not only does Odin not create the matter out of which he forms the universe – Ymir’s corpse – there are entities in the universe that he does not form at all (some of which pre-exist him, and continue to exist after his seizure of power, such as the Frost Giants). The most significant feature of the universe that is not created by Odin is Yggdrasill. There is no mention in any of the sources of Yggdrasill having been created by him. And it does not make sense to think that Odin created the three Norns (Urth, Verdandi, and Skuld) who weave his destiny, as they do the destiny of all other beings. It also makes little sense to think that he created the Völva (the Seeress) whom he consults in Völuspá. If he created her, why does he need to seek her counsel? Why wouldn’t he know what she knows? (Her words, in fact, imply that she remembers the time prior to the coming of Odin and the other gods.) And if he had created Mímir and Mímir’s Well, why would he need to ask after their wisdom? Why would he need to give up an eye to gain wisdom from something that he himself had conceived and fashioned? The Allfather is, in truth, not literally father of all. And a pattern has now emerged: in general Odin seeks wisdom from primeval sources he did not himself create. But let us now step back and consider this account as a whole, and try to discern the worldview that it conveys in mythic form. Unlike some “creator gods,” Odin does not pre-exist the natural world. Instead, he arises out of the natural world. Though he himself is fully conscious, with a consciously-directed will (indeed, he is the first being to possess these characteristics) he and everything that precedes him arises as a result of purely unconscious, undirected natural forces. And having come into being, he turns upon nature and says a gigantic “No!” to it, slaying the primal first being and re-fashioning the natural world according to his own consciously-chosen and willed design. In short, through a series of events that happen by purely natural necessity, not choice, nature gives rise to a being who negates nature. Odin’s actions, on the other hand, are not necessitated. They are chosen with full consciousness – a consciousness that simply did not exist prior to him. Looking at the process of creation as a whole, from its beginning in fire and ice to the slaying of Ymir, it would appear that the telos of the natural world is the coming into being of an unnatural being who negates nature as-it-is and re-fashions it according to his own ideas of law and order. And who then seemingly devotes his existence to wresting nature’s secrets from her. Nature gives rise to a conscious being who, as a free agent, is a vehicle of the further unfolding and development of nature itself. The monstrous age of the Titans – an age with few laws and no consciousness – is canceled and, through the agency of Odin, the universe proliferates according to consciously-conceived ideals and laws. Odin imposes his order not just one time – but in his continual governance of things, decreeing of laws, and manipulation of events (as we see, for example, in the Völsungasaga). In doing so, he searches for wisdom that would guide him. This search is itself part of the “plan” of nature – an intrinsic element in the development of the cosmos. Now, at this point one is tempted to draw an obvious conclusion: Odin actually represents humanity. We are, after all, the being who arises out of nature, yet negates the nature that we find, in order to refashion it according to our plans and ideals. But it is not just power over nature that human beings seek, but knowledge and wisdom as well. We seek knowledge that would help us improve our lot in life – but like Odin, we also seek it, and seek it passionately, for its own sake. We may then argue – again, taking Odin to represent the human spirit – that the coming into being of humanity is a part of nature’s process of self-completion. Nature is transformed and re-organized through man’s labor, and the plans and ideals we put into it. Further – and this point is absolutely crucial – through the production of a species that yearns (like Odin) to know everything in heaven and on earth, nature achieves consciousness of itself. In other words, nature reveals itself as a process, an unfolding of myriad forms, which issues in a very special sort of natural-supernatural being (man) who, through his relentless quest for knowledge and self-knowledge, holds up a mirror to nature itself. We are all Odin, it seems. Or at least those of us who are lovers of wisdom. And thus we can now see that Odinism is much more than one path among others. Odinism – the search for wisdom – is the path of divinization. It is the highest of all the “forms” in the universe, and the one that comprehends all others. Anyone who pursues wisdom ceaselessly, fearlessly, and uncompromisingly, forsaking all else (including piety, reputation, and personal safety), is an Odinist, whether he realizes it or not. And it is to give rise to such men that the universe exists at all. The above account is certainly an exalted one. But it is incomplete in one crucial respect, as I will explain in the next section. See Jan De Vries, Altnordisches etymologisches Wörterbuch (Leiden: Brill, 1977), 167. By “humanoid” I mean having human-like shape or approximating to the human. Ymir, the Frost Giants, and Búri are humanoid, not human. See my essay “The Ninefold” in What is a Rune? And Other Essays (San Francisco: Counter-Currents, forthcoming). I have discussed the character of the three brothers extensively in my essay “The Gifts of Ódhinn and His Brothers,” in What is a Rune? And Other Essays. The Prose Edda does mention that trees were created from Ymir’s hair. But there is no specific mention of Yggdrasill having been created thus. Given the significance of the World Tree, if it had been created out of Ymir’s remains one would think that Snorri would have mentioned this. Published: July 31, 2017 | This entry was posted in North American New Right and tagged Allfather, Collin Cleary, North American New Right, Odinism, reprints, Tyr. Both comments and trackbacks are currently closed.